Early on Monday morning, NASA succeeded in putting a car-sized, one-ton rover onto the surface of Mars. The moment Curiosity touched down, scientists at NASA’s Jet Propulsion Laboratory erupted into cheers and applause. Presumably a fair few of those watching online around the world punched the air in celebration too; it was, after all, an incredible achievement considering the mind-bending complexity of the mission. At some point before or after the landing, many of you may have taken a moment to watch the simulation video showing the various high-risk maneuvers that Curiosity had to undertake in order to safely touch down. These took place during the so-called “seven minutes of terror” and no doubt had many a NASA scientist biting their fingernails to the quick. 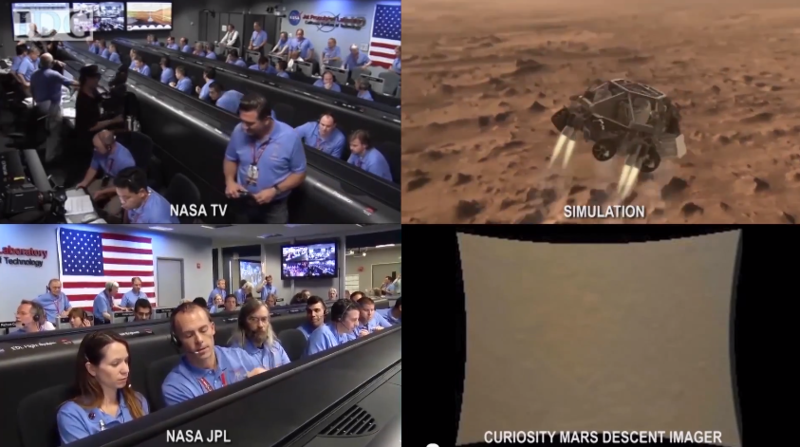 After watching the successful landing, IDG News’ Martyn Williams had the idea to pull together all the NASA video feeds connected to the landing – from NASA TV, the NASA Jet Propulsion Laboratory and the Curiosity Mars Descent Imager, as well as the animated simulation – to create a wonderful four-minute split-screen video showing the events as they happened. The result is a fascinating and entertaining view of the final moments before touchdown, with the scientists responding to key moments during Curiosity’s final descent, as shown in the simulation. You can check it out below. French minister on three-strikes law: "12 million euros per year is expensive for a million emails"